Rhema had a lovely Thanksgiving, surrounded by friends and family. 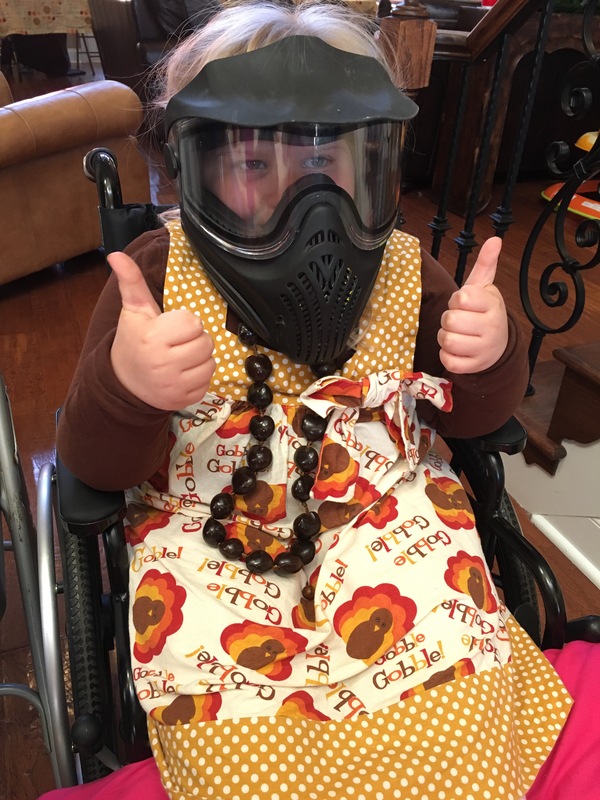 She wore her beautiful turkey dress and a matching Pilgram bow. We’d washed her hair the day before using her special inflatable device since we still has casts on. 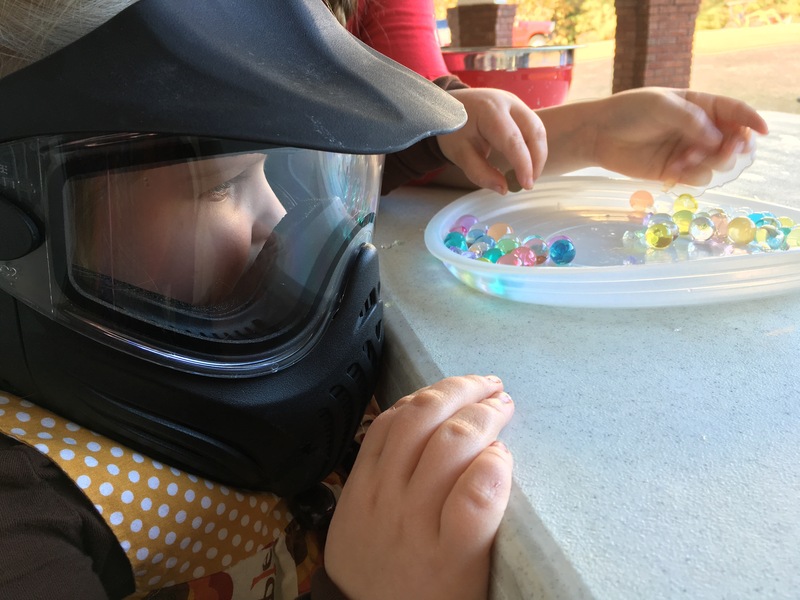 Okay see what had happened was…..
Rhema has a “thing” for masks and helmets. 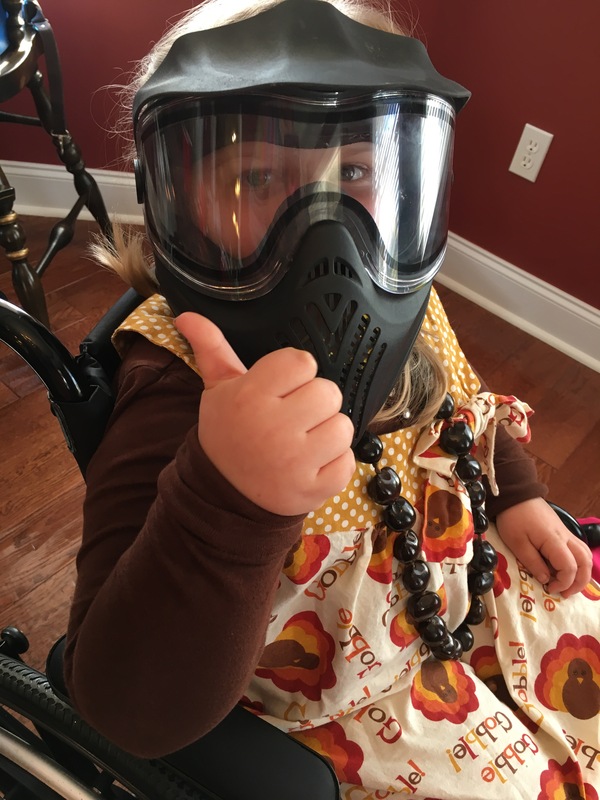 So her Uncle Mike had been telling her he had a paintball mask for months. Finally she got to see it; it took her an hour to be brave enough to put it on— then she would not take it off. She even figured out a way to sip her juice while wearing it. Lol! Then it was time to go outside and ride and she wanted her Auburn helmet. She’s asked for a helmet since last football season but I’ve not wanted to spend $30-50. I’m telling you folks, when this year she began to ask again, I prayed that the Lord would help me find one that was affordable. So,last week I’m waking around a thrift type store and there are 4 Auburn helmets there to pick from, each priced at $12.50. Um, yeah, I’m telling y’all, God loves this little Princess; even in the little things He shows His love. Rhema put on her Auburn helmet and rode that yard for 2 hours! She explored areas she’d never be able to get to in her wheelie, “ran” with the kids and had a blast!!! 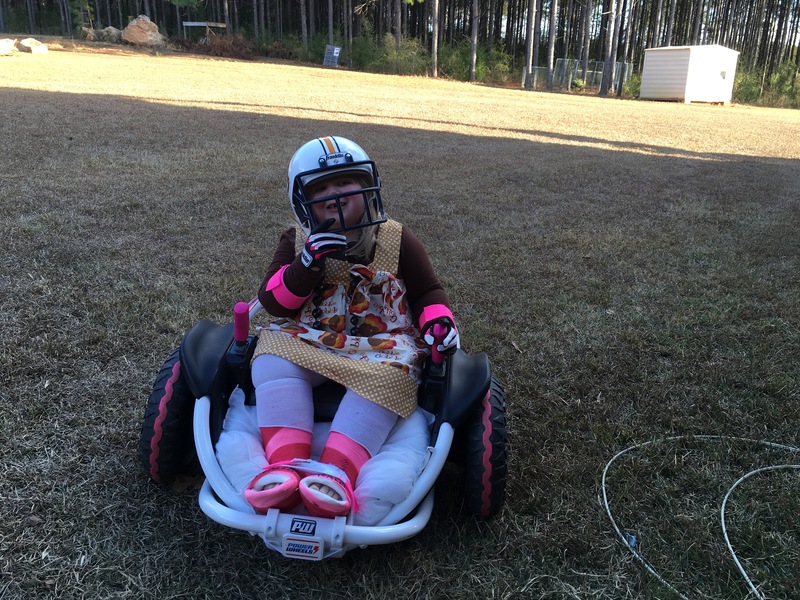 It was hard not to cry to see what this little mobility device has done for our Rhema. So simple and yet, it has changed her outside world. My heart was so full watching her zip around so free! And when it was time for cake, no worries, mamma just fed her through her Auburn football face mask. You know, just like Cam’s mamma probably did! Lol!!!!! We hope you guys all had a Very Wonderful Thanksgiving! We sure did! Now, bring on that Iron Bowl!!! We are ready for it!!!! War Eagle, baby!! !